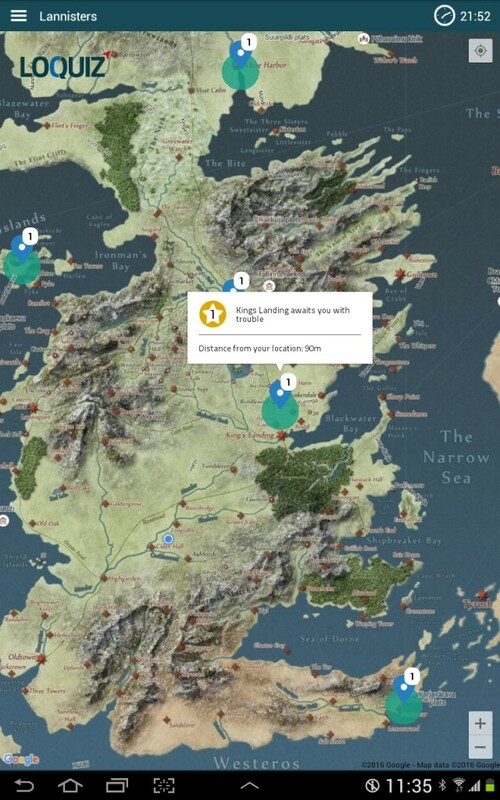 Since the feature to use your own created maps as an overlay on Google maps in outdoor games came out, I have been waiting for a moment to sit down and realise a game concept based on the Game of Thrones world. Playing on smart devices with an imaginary map poses some awesome opportunities as well as points to think through. I chose Tallinn Old Town. Why? Because it is medieval, has lots of interesting places, appropriate atmosphere, and nice taverns to stop by. Not the seven kingdoms, but close enough. From the physical exercise point of view it has uphill and downhill areas, stairs, and towers- so sporty enough. So, exercise for the mind and body is guaranteed. Also, it has a dense net of streets. So when I apply the imaginary map of the area- there is a good chance that important locations on the fantasy map overlap with accessible locations in the real world. Accessibility is an important thing not to overlook! This makes it possible to play the outdoor adventure game when it is complete. The challenge is that old town has narrow streets and GPS reception in some places is poorer. But that is manageable with larger radii, more open area location choices for the questions, and testing the game thoroughly. Currently the overlay image longer side dimensions are fixed to make the game playable on a variety of smart devices. See appropriate image dimensions from support. This meant it was wise to include a part of the original map, crop the image, resize it and sharpen a bit. After that, you have to apply the custom map on a game. +Alpha sets transparency- you might want players to see some of the Google map glowing through. 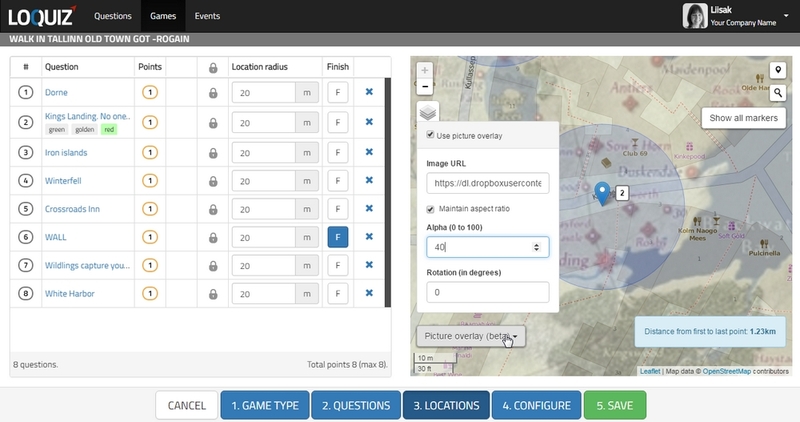 It is also useful during setting up the game to set alpha smaller and make sure locations on the fantasy map are also in an accessible place in the real world. I actually set alpha finally to 100- so during the game the dominant map is the imaginary one. It makes orienteering harder but if players are slightly familiar with the location, it adds fun. Also some base map elements stay on top- so players aren’t left clueless. +To scale your map, drag from the corners of the image. +To move the map to make it overlap the needed places on the base map, use the arrow keys on your keyboard (works only when “Picture overlay (beta)” drop menu is open. +Good games start with good tasks. Visit locations for details to use when composing questions. Players’ favourite tasks are usually to perform with the team or something to look at and notice in the surroundings. Luckily Old town has historical buildings, a bunch of sculptures and cafes with interesting names. For example- near where I set “Kings Landing” in real world is a place called “Three faced man”. +Fairytale game plots need a bit of storytelling. So short logic questions or tasks need some fancying up. Use normal text in Shakespeare or similar generators for added fun. +Add videos as media to questions to add something about the plot of the story told with the game. +Add historic or photoshopped pictures of buildings as media to the questions. Ask players to look at the old image and compare what new elements the building has now. +Add timers to some questions. “You haveth 15 seconds to think” raises tension and adds adrenaline. +Make more complicated questions and add intros, helpful hints and after answer comments to questions. After all, in fairytales there are always “helpful little birds” who whisper you hints. +Remind the safety to anyone who might play your game. Playing with an imaginary map is distracting- in a really good and also in a bad way. So remind to watch out for traffic! I created the Game of Thrones game as fan tribute for my own personal afternoon stroll with no intention to use it for commercial purposes. The beautiful overlay map is a crop from the version of TheMountainGoat. Original artwork is done by Tear from Cartographers forum. 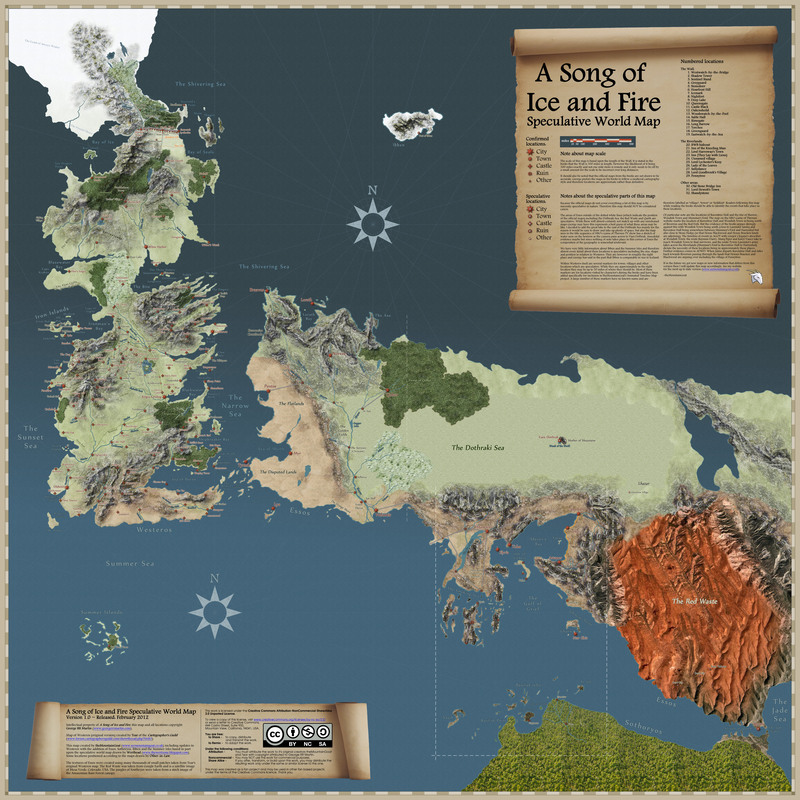 Content, locations, and names from “A Song of Ice and Fire” are George RR Martin’s intellectual property. If you have a wish to create themed game and use it publicly and commercially, think out your own adventure saga : ) or arrange agreements with the authors. Share in the comments below your favorite films and series you would like to create a map for and gamify.